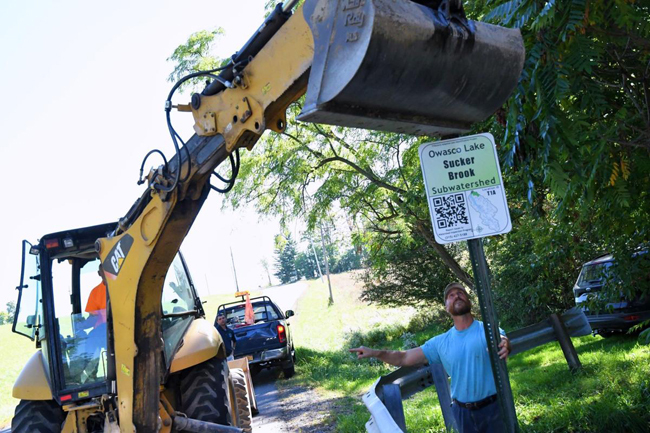 Eddie Pacelli and Andrew Snell install a roadside sign in October 2016 near Sucker Brook in Owasco as part of the Tributary Adoption and Identification Pilot Project. Credit: Gwendolyn Craig/TheCitizen. Oct 11, 2016, Ithaca, NY - Owasco Lake is like the trunk of a tree, said Andrew Snell, a watershed specialist for the lake. Into that tree are tons of branches, which Snell compares to tributaries — streams that feed into the lake. And what those branches carry into the main trunk or water body affects the overall health of the system. The problem, Snell said, is that many people do not know where those tributaries are, or what they are called. To help monitor those crucial lifelines into the lake, Snell is spearheading a project called the Tributary Adoption and Identification Pilot Project. Similar to the state Adopt A Highway program, Snell said, the idea is to get as many eyes as possible on the streams so that any problems or concerns can be reported as quickly as possible. "Hopefully this is the start of building that protective infrastructure around the watershed," Snell said. The pilot project, funded by a New York Sea Grant, will focus on Niles, Owasco and Fleming. Three main tributaries there, including Sucker, Van Ness and Dutch Hollow brooks, will be labeled with the new roadside signs — but the signs aren't your typical highway labels. At the top of the signs are the names of the brooks that drivers, bikers and walkers may cross. In large print, that's the only part of the sign meant to be read by motorists whizzing by. Snell tested this and laughed after clearly reading "Sucker Brook" while driving down the road. "People will know where they're crossing now," he said. But there are even more features of the sign meant for those passing it on foot or bike: a map, an identification number and QR code for smartphones. 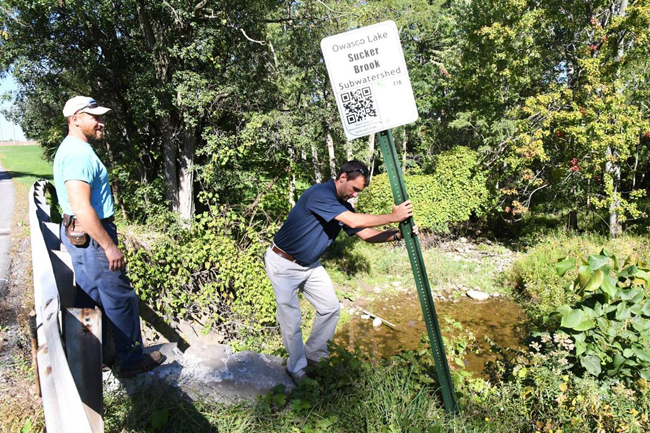 The public can scan the barcode and get more information on the tributary, including its characteristics and water quality information, the inspection program and Owasco Lake. Next to that code is a map that shows where the brook is located in relation to Owasco Lake, and includes a small identifier code. At the bottom of the sign is a phone number to call to reach the Owasco Lake Watershed Inspection team. Snell said he hopes that if anyone sees a spill, discolored liquid moving through the streams, trash in the tributaries or someone dumping into them, that they will call the phone number and report that ID code. "We can then deploy to that location, whatever resource may be needed," he said. "So not only is it information-driven, it's multi-purpose. It provides information, a location identifier for emergency response, and it gets the public involved with eyes on the ground." So far, Snell, with the help and partnership of the local highway departments, has installed a few signs. Overall, there are 25 crossings he plans to mark, with two signs at each location. Once they're all installed, he plans to provide a map with all the identification codes for local fire departments and Cayuga County 911. That way, if there are any major emergencies, help can be dispatched quickly. While this is a pilot program, Snell said he hopes it will evolve and instigate more stream cleanup projects across the watershed. It's another piece to the puzzle of keeping Owasco Lake — the source of drinking water for approximately 45,000 residents in Cayuga County — clean. "We'll see," he said. "We'll see the effectiveness. It'll be nice to track and get feedback from folks." Bob Bruno and Eddie Pacelli install a roadside sign in October 2016 near Sucker Brook in Owasco as part of the Tributary Adoption and Identification Pilot Project. Credit: Gwendolyn Craig/The Citizen.